Chelsea Carr lives three lives. A 2006 Boettcher Scholar and recent graduate of the University of Colorado Law School, Chelsea is working as a law clerk in the 19th Judicial District. After hours and on weekends, however, Chelsea becomes either Svara or Sveni, twin brother and sister from the Viking-age trading town of Birka, circa 850 to 900 AD. 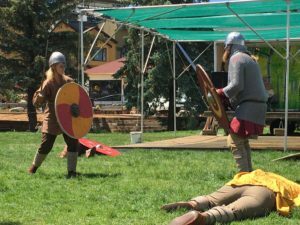 Chelsea is an active member of the Fjellborg Vikings, a historical reenactment group dedicated to the accurate portrayal of the Viking age. The group conducts reenactments at festivals and educational events throughout the state. 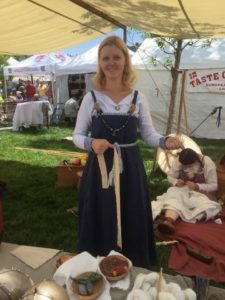 During those events, Chelsea dons hand-sewn clothing and historically accurate battle gear as she teaches visitors about the backstories of her two characters. 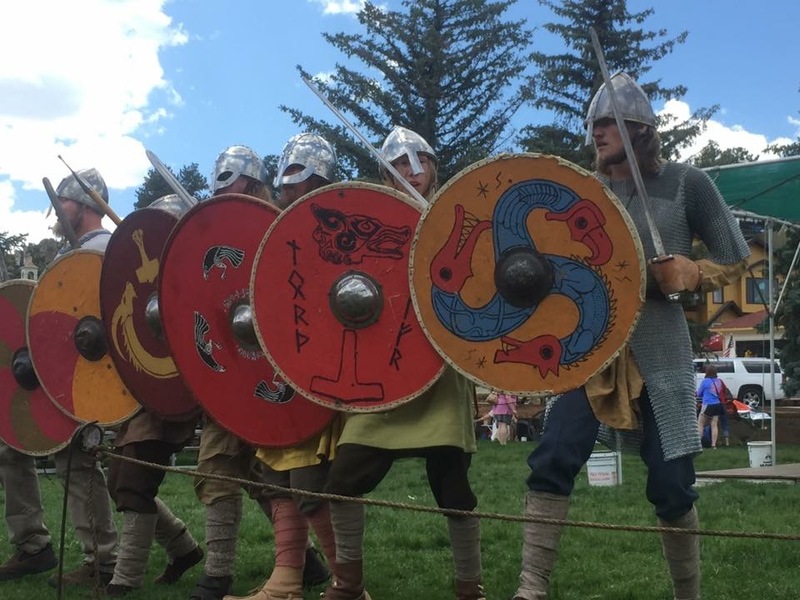 The Fjellborg Vikings will be on one of their biggest stages soon as the group has been called on to assist with the Denver Museum of Nature and Science’s upcoming exhibition “Vikings: Beyond the Legend,” which runs March 10 through August 13. 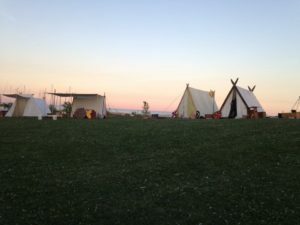 ”It’s a recognition of how far we have come as a group and that we are committed to this level of historical accuracy,” said Chelsea, who also serves on the Fjellborg Viking executive board. The group, which includes approximately 30 members, will perform at VIP opening events and family days, and they have contributed their own handmade, historically accurate materials, including a lute and Viking boat, to expand the exhibition. They are also helping to prepare the museum’s on-staff historical reenactors for their own roles in the exhibit. “We are helping them to create their own historically accurate ‘kits’ that will include everything from clothing to shoes to the details of their lives,” Chelsea said. A big one for Chelsea is the fact that Vikings didn’t wear the horned helmets frequently associated with them. “The beards are real; the horns are not,” she said, explaining that a pamphlet promoting an opera in the 1800s is responsible for popularizing the false characterization. Chelsea’s connection to the Fjellborg Vikings started when she was an undergraduate at CU, majoring in English and journalism and minoring in geology and Nordic studies. 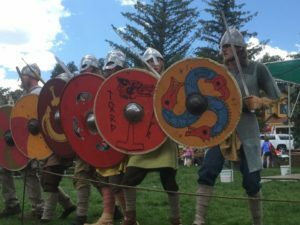 The Fjellborg Vikings would visit campus to participate in a Nordic market day and conduct occasional combat demonstrations. Chelsea stayed in touch with the group and joined after graduation, but she wasn’t able to commit significant time to the pursuit until she graduated from law school. “It was a way to stay active in something I really loved and keep doing something I enjoyed even though my life was taking a different path,” she said. 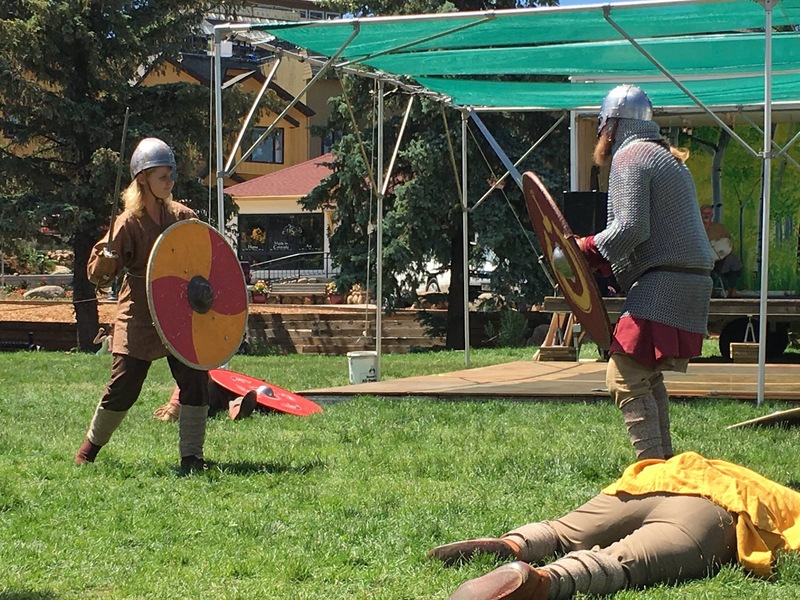 In addition to maintaining a connection to her Nordic studies minor, Viking reenactment provides a link to Chelsea’s youth. One part of Viking life that wasn’t part of Chelsea’s youth: combat. The Fjellborg Vikings have twice-monthly training sessions where they work on their battle techniques. They are frequently assessed on their battle styles and have to pass tests before they are allowed to practice combat in front of people. The bows and arrows used by the Fjellborg Vikings are modified so they’ll never strike their target with force harder than a paintball. The group also uses handmade shields and swords that are not sharp but are heavy enough to inflict serious bruises. For her part, Chelsea prefers to do battle with an axe, and she’s hoping to become certified as an archery instructor for other historical reenactors. As Chelsea contemplates the path her life has taken since becoming a Boettcher Scholar, she’s certain that her life as Svara and Sveni – or as a law school grad – wouldn’t have been possible without the Boettcher Foundation’s support. “Getting a Boettcher Scholarship changed my life,” Chelsea said. “I came from a big family in a small town that did not have the money to send me to college. While Chelsea figured she’d find a way to pay for college, she had her sights set on a less expensive college, and she certainly didn’t consider law school a possibility. The Boettcher Scholarship also allowed Chelsea to study abroad in Sweden, helping to cement her interest in Nordic studies and the Viking Age.